"The Cosmic Detective is an inspirational read. 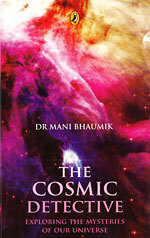 Dr. Bhaumik tackles topics with impressive scope, yet delves into them with spirit rarely seen. Marrying scientifically accurate text with accessible language is no easy task, but The Cosmic Detective is proof that it can be done." "The Cosmic Detective reveals another one of Mani Bhaumik's talents: he is an outstanding science writer to complement his demonstrated scientific insight. He has the unique ability to distill from the voluminous material the essential concepts for the general public."